Peel the whole eggplant or you can peel striped. Slice them in ½ inch wide and then place them in a bowl and cover the eggplants with water. Let them stand for 30 minutes in water. Then, drain the eggplants and wipe with a piece of cloth. In a large skillet place the oil and fry the eggplants until they change in color. Do not over fry for not to damage the pieces. Place the fried eggplant pieces in a Pyrex dish and sprinkle salt on them. You can use the same skillet or a smaller one. Place the ground beef and 1 tbsp oil and cook until the meat changes in color. Then add the chopped onions and sauté for 1-2 minutes. Add the chopped peppers, garlic (optional) tomatoes or tomato paste and ½ tbsp salt. Sauté for 5 minutes. Finally add the cumin and black pepper. Spread this mixture evenly on the fried eggplants and add the hot water. Preheat the oven to 375 F (190 C) and cook for about 30 minutes. You can serve this dish with pilaf and yogurt. Patlicanlari yikayip, butun patlicanlari soyabilirsiniz ya da seritli sekilde de soyabilirsiniz. Yaklasik 1 ½ cm kalinliginda dilimleyin ve dilimlenmis patlicanlari buyuk bir kaseye koyup uzerine cikana dek su doldurun. Patlicanin acimsi tadinin suya gecmesi icin yaklasik 30 dakika suda bekletin. Sonra patlicanlari suzup, kurulayin. Genis bir tavaya yagi koyup patlicanlari renk degistirene dek kizartin. Fazla kizartirsaniz, patlicanlarin sekli bozulur. Kizarmis patlicanlari borcam bir tepsiye alin ve uzerine tuz serpin. Ayni tavada ya da baska birinde 1 yemek kasigi sivi yagi ve kiymayi renk degistirene dek kavurun. Sonra soganlari ilave edip 1-2 dakika sote edin. Biberleri, sarimsak, tuz ve domatesi/domates salcasi ilave edin. 5 dakika ksik ateste pisirin.Son olarak kimyon ve karabiberi ilave edin. Kiymali karisimi kizarmis patlicanlarin uzerine esit olarak yayin ve sicak suyu ilave edin. Onceden isitilmis 190 C (375 ) firinda yaklasik 30 dakika pisirin. Patlican musakka/oturtmayi pilav ve yogurt ile servis edebilirsiniz. Thank you very much. I am very happy to have the first comment on my site. I will continue to add more recipes to make it even better. I hope you will try couple of my recipes. I tried the recipe and I must admit that it was wonderful. Thank you for sharing. 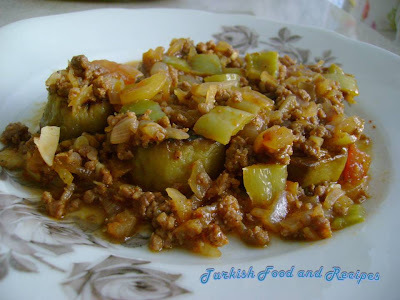 Thank you for posting these recipies, my boyfriend is from Turkey and he loves when I cook him food that reminds him of home. Thanks so much.